Earth Moon Stars Studio's scarves are lighter than spring, brighter than summer, and can be worn throughout the year. 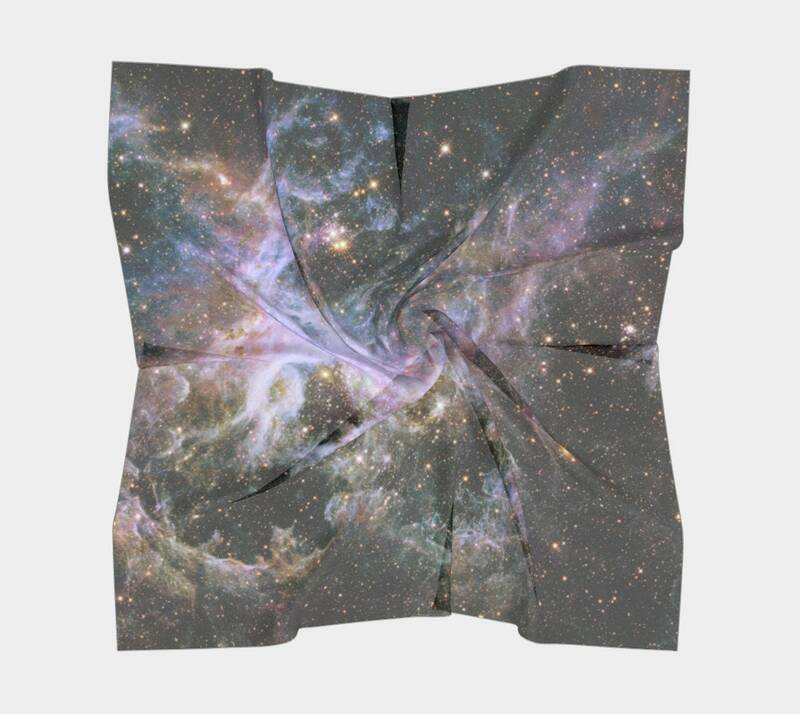 Breeze through your day with our scarves inspired by the Earth, Moon, and Stars. The soft sheer fabric will look great with any outfit and adds a celestial finishing touch. This Scarf is made-to-order, meaning it is specially made for you and is not kept in stock. Please note that colors may vary from what you see on your screen, as all devices and monitors are different. Very nice material! I didn't expect the graphics to come out as pixely, but I think my boyfriend likes it. The design is just beautiful, and the quality is even better than expected. I absolutely love it! Great quality and fast shipping to U.K! Payments through Etsy Direct Checkout & PayPal are accepted. Payment is due at time of purchase in order to get your item(s) shipped as soon as possible! EarthMoonStarsStudio items are all made-to-order. Made to Order items cannot be returned/refunded. They are created specifically upon order, and are not kept in stock. If you receive a damaged item, please contact me within 3 days of receiving the item, along with a picture of the damaged item, and we will have another exact item created and sent to you as a replacement. The replacement will be the same size and design as originally ordered. As part of the replacement, you may be required to send the defective or wrong item back to us. Shipping costs are non-refundable. All orders are made to order and can not be cancelled. Production on any of these items happens the moment your order is placed, and this process cannot be reversed. By purchasing, you are confirming your acknowledgement of this. As previously stated items will not be returned/refunded once an item has been shipped. All EarthMoonStarsStudio shop items are shipped within 4-7 business days, this does not include transit time (the time it takes our carrier to deliver your package). If your order is being shipped within the United States, your package(s) will typically arrive within 3-9 days after being shipped via USPS. However if there are any local post office delays, routing issues, or bad weather, it may take (longer) up to 20 days. The ship times given are estimates and not guaranteed. International Shipping should take 1-3 weeks to be delivered. However delays can occur in transit, so it's possible to take up to 5 weeks for an order to be delivered. Unfortunately, tracking information isn't available for International Shipping. DHL Global Mail is used for all our International deliveries. Once your package passes through customs it will be delivered by your local post office. All items are shipped from the United States. At checkout, please confirm and double-check that the address through Etsy is the correct shipping address you'd like the order sent to. I will contact you on receipt of your order to let you know when to expect dispatch. A tracking number will be provided when available.